Saidi Dental Group is excited to offer same-day crowns. We want our patients to receive the highest quality care using cutting-edge technologies. Our CEREC machine uses CAD/CAM technology to streamline the restoration process. Dr. Saidi and Dr. Jin’s patients can count on their expertise and contemporary technology to recover their smile as soon as possible. CAD/CAM stands for computer-aided designing and computer-aided manufacturing. The use of a computer eliminates human error and ensures the restoration fits precisely in your smile. This machine produces the highest quality restorations in the shortest amount of time possible. In fact, CEREC machines can mill crowns in as little as five minutes. It also can craft bridges, veneers, implant crowns, and custom implant abutments. CEREC same day ceramic crowns are created from a single piece of ceramic using a precise computer-guided milling system and are designed to be a perfect match to your existing teeth. Check out these before and after pictures of happy patients. First, Dr. Saidi or Dr. Jin takes 3D images of your entire oral structure. They use an intra-oral camera no larger than the ball of a pen. It scans accurately within a tenth of a millimetre and allows the restoration construction to begin promptly. Within minutes, the ceramic crown is milled. Afterwards, the colour match and custom dye process begins. Because the crown is made so quickly, it allows the tooth to be re-fired or remade if the colour match is deemed incorrect. This ensures complete patient satisfaction, one of the multitudes of benefits to the same-day crown service. Same-day crowns offer unique advantages for our patients. 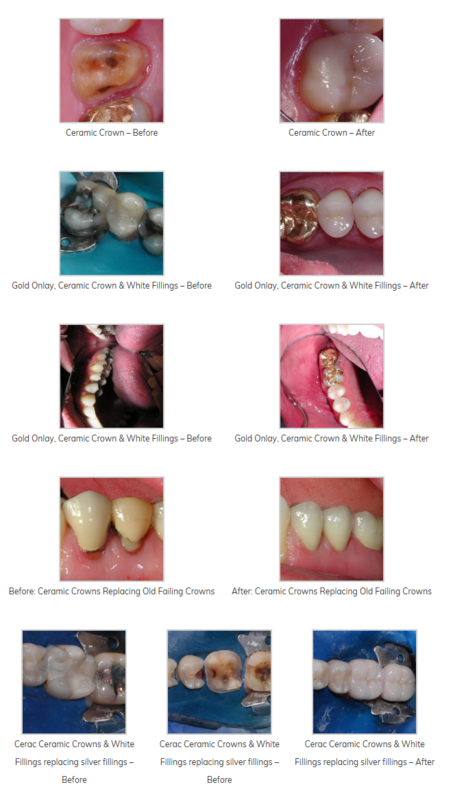 Many aspects of this service are superior to conventional lab-made crowns. Comfortable: Avoid putty impression pastes. The digital impression process is quick and minimally invasive. Avoid temporary crown failure and the resulting sensitivity. Discreet: Complete a restoration in just one appointment before anyone notices the damage. Saves time: Get back to your life quicker with fewer appointments, less time away from work, and less time waiting for crowns to be completed in a lab. Saves money: Save potential earnings by taking less time off work. Prevent injury: Temporary crowns do not fit well and may dislodge, leading to damage. Same day crowns protect the integrity of natural teeth because they require less drilling and save more organic tooth matter. We offer emergency dentistry that can completely restore damage in just one appointment. This is a vital service we offer to our patients in Langley and the surrounding communities. The potential for bone resorption increases without teeth. This can make it more challenging to replace teeth. Same-day crowns allow you to replace missing or decayed teeth at the first sign of damage. For more information on same-day crowns or general services, please give Saidi Dental Group a call. Schedule an appointment with us today, 604-757-1224. We look forward to restoring your smile.